This is a redo of The South African Butler Academy’s Website. SABA had a static website which was becoming a bit outdated and needed a platform from which they could constantly add new content. I built them a Custom WordPress Theme over which they have full control. These guys are really fun to work with and they run an excellent establishment. Anyone needing ideas on how to run a Facebook page to perfection should check them out. 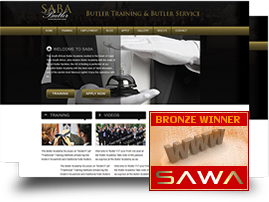 The South African Butler Academy has a won a Bronze South African Web Award.